How does a telescopic fishing rod work? Q: Can I use a telescoping rod for every fishing technique and every fish? Q: Should I use different reels, lures or lines for a telescopic fishing rod? Q: How can clean my telescopic fishing rod? A fishing rod is an essential fishing tool that every angler needs, whether you are a freshwater or saltwater angler. On the market, there are one-piece, two-piece or telescopic fishing rods. This article will analyze critically the category of telescopic rods, and after that, I will give you a review of the best telescopic fishing rods. A telescopic fishing rod consists of multiple sections which are designed to slip into each other to be compact. Every piece has a guide and when the rod is fully extended the only thing you have to do is to attach a reel. Put a line, and you are ready to fish! The concept of a telescopic rod is simple, as it allows to be folded up for easy transportation. You can transport it very easy, and you can store it in your fishing backpack or car. Not to mention that every piece is totally protected from the elements of nature. Do not despair. Just repair. Every angler has accidentally stepped on a rod guide or broken apart. The majority, would put the rod in the garage and just forget about it, but with a telescopic rod, there is no need to that. With a wide variety of replacement parts for every telescoping rod, it is easy to fix the problem. A telescopic fishing rod is designed in such way so it can bend more than other rods. As a result, you can feel every fish bite, and this will provide better fish fighting capacity. The flexing action of a rod multiplies the strength of the fishing line. Opening and closing the parts can damage them, and you have to clean it every time you use it. Every fishing technique requires different fishing tools. Thus you have to choose the appropriate fishing rod for your fishing technique. I will analyze step-by-step some things you have to take into consideration to choose the rod that fulfills every need. Spinning-fly-fishing: For this technique, you need a thin telescopic rod with five or six parts guides, and it should be between two and three meters long. Furthermore, the action weight should be five to thirty grams. (Action weight is the suitable weight for the fishing lures). Casting-surf fishing: Here you will need a thicker telescopic rod, and it should also gain in length. A five to seven parts rod with a length between two and four meters is ideal. The casting weight should be between hundred and four hundred grams. Match fishing: This fishing rod should consist of ten extra thin sections, as you are fishing with fishing floats. The ideal length is between three and five meters, and the match weight should be between four and twenty grams. As far as the material is concerned, the rod’s body should be made of fiberglass or carbon (the-carbon, heavy duty carbon, etc.). Moreover, the handle should be made of graphite, aluminum, steel or plastic and the line guides should have two parts, a metal frame and a form of an insert using ceramic. Moreover, the handle should be made of graphite, aluminum, steel or plastic and the line guides should have two parts, a metal frame and a form of an insert using ceramic. A telescopic fishing rod has the same construction as every common fishing rod. Tenkara fishing rod: These rods neither have any guides nor a reel seat, and the line is tied directly to the tip of the rod. Multiple-Guide rod: These rods have many guides to secure the line. The action is how easily and how far from the tip a rod will bend. For instance, a fishing rod with 5 lbs. Action bends more than a rod with an action of 30 lbs. However, you have to take the material and rod type into consideration, for example, a carbon spinning rod bends more than a fiberglass casting rod. Companies categorize rods as light power, medium power or heavy power. For instance, heavier power rods require more pressure to bend than light power rods. Length: A telescopic fishing rod can be between two and ten meters long. But that depends on the fishing rod type which was mentioned above. Weight: The subject of rod weight is very important, because it affects the casting, especially if you are spin fishing and the transportation. Here is a little table with the fishing rod types and the ideal weight. This fishing rod is specially designed for newbie anglers, as it comes in two combo packages. The first combo has the rod and the reel and the second has some extra fishing lures, fishing hooks, line and some other useful accessories. High Elasticity and Durability: This fishing rod offers great elasticity and durability as it is made of high-density Carbon fiber mixed with fiberglass. Reel: HA3000 model with gear ratio 5.2:1. Emphasis should be laid on the fact that it is a perfect for all anglers, whether you are o newbie or an experienced fisher. The cost is another major factor when considering the purchase of a fishing rod, and we can say that it is a really ‘’easy-on-the-wallet’’ rod. 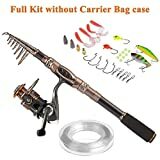 If you want an alternative that can do well in almost any fishing technique, then you have to take a look at this fishing rod. With this telescopic rod, you can travel wherever you want and keep it safe in your backpack as it is portable. High-Quality Materials: It is made of carbon fiber and E-Glass. These materials guarantee that your rod will last a lifetime. Moreover, due to these materials, the fishing rod is very lightweight. Real Seat: Just thinking of the construction material which is machined Aluminum should be enough to make you understand that it is a durable reel seat. Guides: Ceramic guides with stainless steel frame ideal for mono or braided fishing line. This high quality spinning telescopic rod has many features and is specially designed for fishing enthusiasts. To sum up, it is affordable and ideal for someone who wants to invest in a durable rod. The Eagle Claw is a simple and strong fishing rod. You can get many benefits at the price of one. Furthermore, it is remarkably comfortable to hold as it has an EVA foam handle grip and it is portable. Minimal Design: The dimensions are 19.3 x 5.1 x 2 inches. It can be considered as a’’ minimal’’ fishing rod, and you can transport it even in your backpack. Rod Power: Medium Power with line weight 4-10 lbs. And a lure weight of 3-10g. 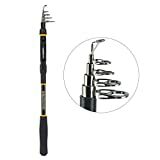 Summarizing, this versatile telescopic fishing rod allows you to do many fishing techniques, and you can take it wherever you want. With several impressive features, it is a decent overall fishing rod. Are you an avid angler? If yes, this fishing rod is constructed for you. It can withstand harsh weather conditions, and it is made for heavy duty use. You can use it for freshwater or saltwater angling, and it can easily fit in your car trunk. Heavy duty material: It is made of carbon fiber, and E-glass and the reel seat is made of corrosion resistant CNC machined aluminum. KastKing BlackHawk guarantees that the rod will last a lifetime without to rust. Guides: Three saltwater and abrasion resistant ceramic guides ideal for monofilament or braided fishing line. Line Weight: Up to 15 lbs. The high line weight is really good for catching big fish. Overall, it is perfect for each angler who wants to be mobile. Emphasis should be laid on the fact that the material is hard enough to withstand any abuse. An extraordinary fishing rod with a beautiful design. Supertrip guarantees that this rod will pass the test of time due to the sturdy materials. 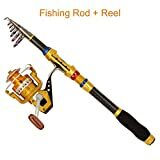 Manufacturers created this fishing rod especially for demanding and difficult customers, as it is rigged for saltwater fishing and many other features. Tough Reel: The reel has a long cast spool and a brass pinion gear. Moreover, you can put the metal handles to the right or left side. Emphasis should be laid on the fact that it has a steel rack bar transmission structure so you can land a fish with minimal effort. This telescopic rod will meet all your expectations. It has a beautiful and spectacular design and is both durable and stable. The majority of the customers could characterize it as expensive, but it is a value for money product. It is suitable for people who want to learn fishing or want just a high-quality rod. Answer: The answer is yes of course. Telescopic fishing rods come in many types, and you can use it for any fishing technique. Furthermore, there is a wide variety of line weight as for the traditional fishing rods. Answer: You can use every reel, fishing lure, and line. You do not have to buy special equipment for the telescopic rod. Answer: It is of vital importance to keep your rod clean because it consists of many parts. If something gets stuck between the parts, you will be unable to open it. Cleaning: After each fishing trip you have to clean it with a wet towel. Do not forget the line guides. After that, you have to dry it. Tip: Do not expose it directly to the sunlight because the colors can fade. Our lives become more over-scheduled every year, and fishing is a good chance to escape from the daily routine. This magnificent and rapidly growing sport has only benefits. 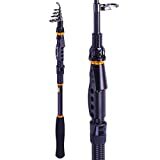 Another key point is that telescopic fishing rods became very popular amongst the fishing community because they are nimble, portable and affordable. Above we analyzed the top 5 telescopic fishing rods critically. We hope that you have now a well-rounded view of the product and good luck! Do you have any helpful tips? Please share your stories with us in the comments section below.